The Gettysburg Clash was worth the wait. Originally it was suppose to be run on May 15th, but Mother Nature had other thoughts and it was postponed until the 16th. The initial clash of the year between the Outlaws and the PA Posse was a barn burner. But in the end, the results echoed last year’s with Danny Dietrich besting the Outlaws for the second year in a row. Dietrich, who has been struggling at his home track this year, held off a hard charging wide open Donny Schatz to claim the first win for the Posse on the weekend. 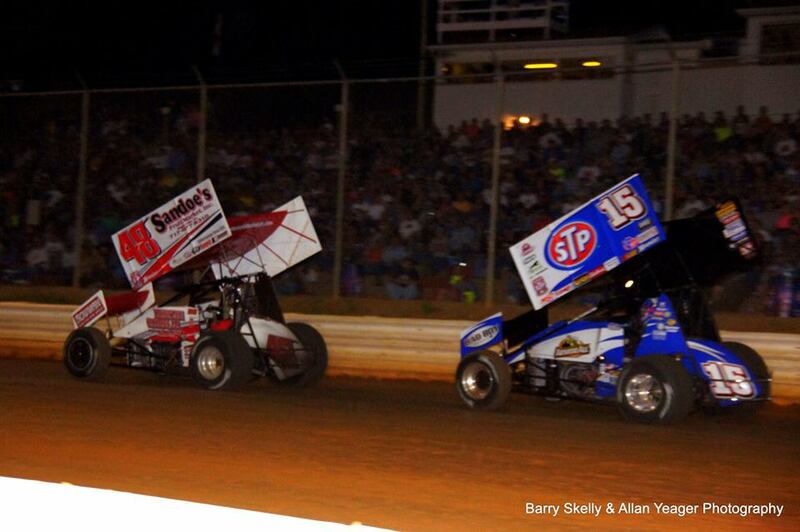 The Outlaws and the PA Posse took to the historical banks of Lincoln Speedway 43 cars strong. All of the jabs and the crowing were done. It was time to race and it was time to show what you had. The track record for a 410 sprint car was set by Fred Rahmer on May 4, 2013 with a lap of 13.089 seconds. That record would stand. Sammy Swindell would set quick time on the night with a lap of 13.617 seconds. The rest of the top five in qualifying were Brian Montieth, Fred Rahmer, Chad Kemenah and Joey Saldana. The later the qualifying run was made in the order the slower the time was tonight. The first heat race went to an invader with Tim Kaeding coming across the line first followed by Brad Sweet, Craig Dollansky, Sammy Swindell and Joey Saldana; all would transfer to the A Main. Just missing the final transfer spot was 20 time Outlaw champion Steve Kinser. The second heat would go to the Posse with Danny Dietrich setting the bar early. Also transferring to the A main were Paul McMahan, Daryn Pittman, Brian Montieth and Lance Dewease. Kyle Larson would lose the final transfer spot on the final lap out of turn 4. The third heat would go to the Outlaws with reigning and five-time champion Donny Schatz coming across the line first closely pursued by Cody Darrah. Fred Rahmer, Stevie Smith, Justin Henderson and Logan Schuchart would also transfer to the A Main. The fourth heat would go to the Posse with Brent Marks setting an early pace and never looking back. Sam Hafertepe, Jr. Kerry Madsen, Chad Kemenah and Chad Layton would advance to the A. With 43 cars in the field, a C main was on tap. Having had engine issues in qualifying, Jac Haudenschild would start last in the C Main. The Wild Child would put on a show coming from eighth to second before clipping the Turn Two wall with the right rear and getting upside down. Haudenschild was uninjured but his night was over. Also finding his roof in the C was Jason Leffler. Leffler clipped the right rear in Turn One and like Haudenschild flipped the car. He climbed out and walked away without injury. The C would be won by Outlaws driver Jason Sides who came from the third spot to cross the line in front of Jim Siegal to transfer to the back of the B. The Dash was a battle royal between Danny Dietrich, Tim Kaeding and Donny Schatz. Dietrich would claim the pole for the A with the win. But he was swimming in shark infested waters. To his right would be the king of the invaders in Kaeding and on his back bumper the reigning Outlaws champion Donny Schatz. If Dietrich was worried he didn’t show it. The Last Chance Showdown was a fast 12-lap affair to seal the fates of the masses. David Gravel would easily take the win over Steve Kinser and Kyle Larson. The final transfer spot was contested highly throughout the B main. Gerald McIntrye would hold off Alan Krimes by just 25/1000ths of a second to take the last spot in the A. Taking a Lincoln Speedway points provisional to get into the A was Adam Wilt who started the race in 25th position. The A Main was 35 laps of action. Danny Dietrich jumped to the lead on the green flag. But Donny Schatz jumped as well and took second from Tim Kaeding on Lap 2. Schatz began working Dietrich from that point on. The 35 laps were slowed only three times and only three times did Dietrich have time to breath. Dietrich started side by side with Schatz three times always from the bottom groove. Sammy Swindell had worked his way up to third and was sitting just within striking distance if Schatz bobbled. In the end Dietrich would hold off the five-time champion by a car length to repeat as the winner of the Gettysburg Clash. First Blood in the battle between the Outlaws and the Posse was drawn by the Posse. But the first wave of the war has only just begun. The next two nights are for the Morgan Cup in Williams Grove. The Cup has lived in Charlotte, North Carolina for the past year in the offices of the World of Outlaws after it was won by The King of the Outlaws, Steve Kinser. Can he repeat? Will Donny Schatz continue on his streak of speed? Will Sammy Swindell lead the Outlaws in an uprising in the heart of Posse country or will one of the Pennsylvania boys come to the front and claim the Cup? Only time will tell. In the mean time are you Posse? Or are you an Outlaw? Pick your side. Pick your driver and we will see you at the Grove tomorrow night. C Main Results: 1) Jason Sides 2) Jim Siegel 3) Jacob Allen 4) Ryan Wilson 5) Bill Rose 6) Jac Haudenschild 7) Jason Leffler.